Parks could be the answer for some cities wrestling with drug-related violence, vandalism, and theft. 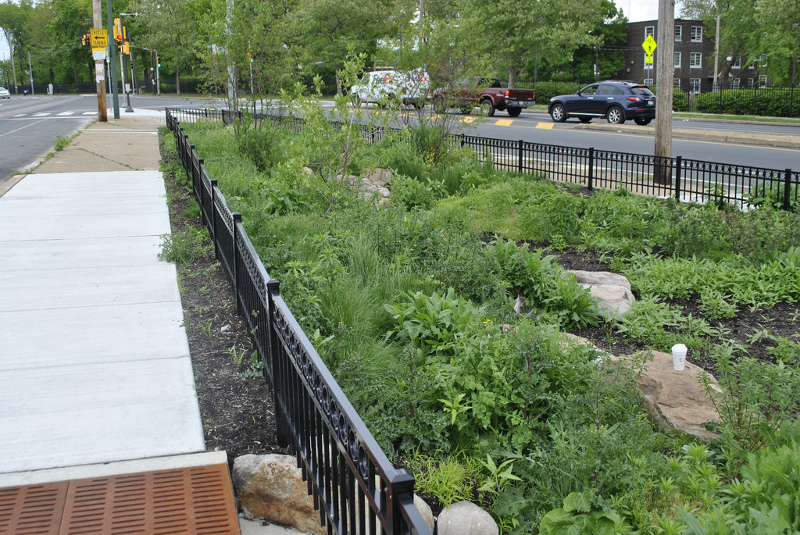 Landscaped urban spaces like this rain garden in Philadelphia provide more than low-impact design infrastructure. They may also fight crime. Urban trees contribute to higher birth weights and lower asthma rates, and now multiple experiments suggest that green spaces might also reduce crime, according to Citylab’s Julian Spector. doing nothing (the control group). The city analyzed data from 2010 to 2014 and found a lower rate of both property crime and violent crime around the lots maintained by contractors and community members. Analysis showed that crime didn’t merely move to a different street corner, as the broader area around the lots saw a decrease in crime as well. The city of Philadelphia created a program in 2000 to plant roadside areas to soak up rainwater and prevent rainwater runoff. A subsequent study found a decrease in narcotics possession around the 52 planted areas. Despite drug possession rates increasing by 65% citywide, possession fell 18% to 27% in the areas with landscaping upgrades when compared to the non-vegetated control sites. The field of research connecting crime and green space maintenance is relatively new, Spector points out, so the exact implications are still being examined.